By Dr Anita Quye, Senior Lecturer, Conservation Science. Studying one historical dyeing manual with beautiful textile swatches is exciting enough. Comparing multiple copies of the same book for colour similarities and differences is a rare treat. Thanks to funding secured from the Worshipful Company of Dyers by Dr Susan Kay-Williams, textile historian and chief executive of the Royal School of Needlework, Susan and I could unite and examine eight copies of a late 19th century dyer’s manual, assisted by postdoctoral researcher Dr Jing Han and PhD student Julie Wertz, both from the CTC. The ‘David Smith Unpacked’ project focused on one manual – ‘The English Dyer’. Its author, David Smith, was a dyer and manufacturing chemist in Halifax, North England. In 1882, Smith published his manual with 500 dyed textile ‘patterns’ attached to pages of dyeing instructions. The named dyes in Smith’s manual interested Susan and I for complimentary research reasons – for me the range of early aniline synthetic dyes, and for Susan the whole range of colours featured and how the recipes and colours available had changed and developed after the introduction of synthetic dyes, as Smith is one of the few people to write dye manuals before and after the 1856 discovery of aniline mauve. Susan first discovered that some of the swatches did not match each other when comparing her copy with those in the British Library (BL). 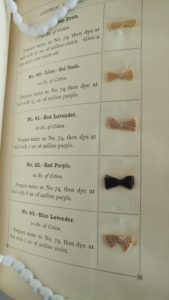 After further comparing our personal copies of Smith, we wondered if the colour differences we noticed were inherent in the dyes or consequences of ageing and use. Perhaps answers would be found by comparison with other copies of the book we knew of in several UK archives and libraries as a simultaneous exercise? Thanks to interest from the British Library to include their two copies of Smith’s 1882 manual, Susan and I united them with our two manuals plus loaned copies from the Universities of Glasgow (UoG), Leeds and Manchester, and the Society of Dyers and Colourists in Bradford. 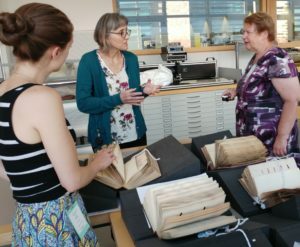 The enthusiastic support of the British Library head of conservation Dr Cordelia Rogerson, textile conservator Liz Rose, and curator Helen Peden was invaluable. Over two intense days, we visually compared the colours of the 500 dyed patterns of cotton, wool and silk across the eight copies. Interestingly and encouragingly the majority of patterns appeared visibly similar across all the copies, even when a dye looked faded or degraded. The manuals had survived well, especially as several had a ‘working-life’ look. Overall the patterns were well-ordered and the manuals seemingly assembled carefully, Only a small number of random patterns were missing. 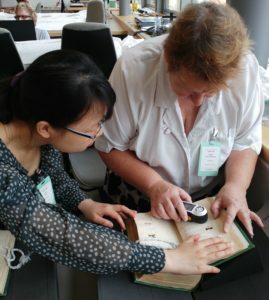 Susan Kay Williams taking colouring measurements with Jing. There were a number of small to significant colour differences and Susan examined these more objectively with a colorimeter to measure L*a*b and ΔE values. Once processed, the data will reveal how similar or dissimilar these perceived colour differences really are. Back at the CTC, my research team and I will apply UHPLC-PDA micro-chemical dye analysis to selected patterns with distinctly dissimilar colours in the two personal copies, the UoG copy and one of the BL copies. By comparing their chemical profiles, relationships between the dyes will be better understood, and whether the named dyes in these instructions were actually used. 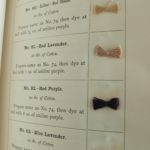 Besides our colour interests, ‘David Smith Unpacked’ raised many practical questions about publishing these dye manuals, popular in the mid- to late 19th century. How many of ‘The English Dyer’ were made? How much dyed material was needed? Who attached the patterns? And how did one prepare and enter all the dyed samples? With great care and attention, it seems. For me, wondering when the books were last together, if ever, was thrilling. I intend to relive the feeling again soon.